... ready to leave now .... Only 2 puppies left from previous litter who are 11 weeks old... And another litter also Solid Blue is 5 weeks old. ... We have 1 boy and 1 girl available 11 weeks old. They are KC REGISTERED with 5 Generation Pedegree. microchipped. defleated and dewormed regularly. They been vet checked and had both vaccination done so now they can go outside for toilet and play . All our Frenchies are healthy and very playfull. Both parents and grandparents are solid Blue and they comes from Best Shuretti and Twickbull lines ...... From previous litter 11 weeks old. Female .yellow collar. 1800. Boy .blue.green collar. 1800. From 5 weeks old litter we have 4 girls 2300. each and 5 boys .2 boys reserved. 2000. each.KC and HC CLEAR. Puppies are use to children and handled with care on everyday basics. They will come with 5 weeks free insurance. ... They get lots of love and best possible start ... Thank you for reading. 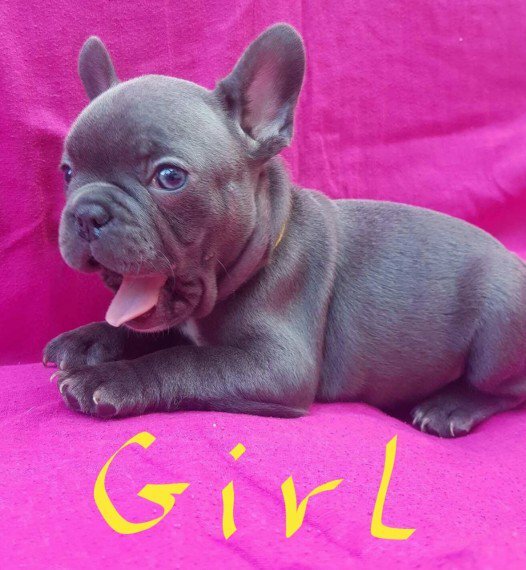 If you have any questions about these good quality Frenchies please do not hestiate to contact us.